Live the triple chocolate dream with this showstopping mousse cake. We’ve got a video here to take you through the recipe, step by simple step. Triple-Chocolate Mousse Cake Live the triple chocolate dream with this showstopping mousse cake. We've got a video here to take you through the recipe, step by simple step. Beat cake mix, water, oil and 3 eggs in large bowl with mixer 2 min. or until blended. Add sour cream; mix well. Pour over syrup in pan. Beat cream cheese and sugar in separate bowl with mixer until blended. Add remaining eggs; mix well. 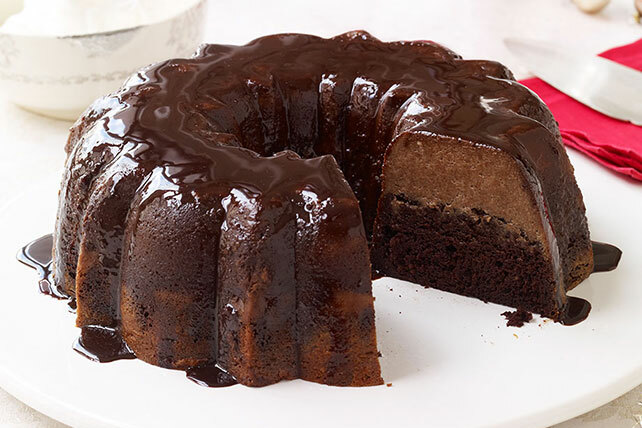 Blend in evaporated milk and melted chocolate; gently spoon over cake batter in pan. Cover with Reynolds Wrap® Aluminum Foil sprayed with cooking spray, sprayed side down. Place tube pan in large shallow pan. Add enough water to larger pan to come at least 2 inches up side of tube pan. Bake 1 hour 30 min. or until toothpick inserted near center comes out clean. Cool cake completely in pan. Refrigerate 2 hours. Invert cake onto plate; remove pan. Serve cake topped with COOL WHIP.